Most of these games are of course produced in Japan, and remain largely unknown to a non-Japanese audience. In recent times however a few companies have arisen that license many of the more popular titles and translate and release them for western audiences. Some of the more well known of these include JAST USA, Aksys, and MangaGamer. And, like the anime and manga worlds, there are quite a few unofficial fan translations out there as well. There are a very few non-Japanese developed games in this category, but the love-sim industry remains largely Japanese-dominated. Well one company is hoping to change that. Okashi Studios, founded in 2005 and based in San Francisco, has been working these past five years to bring to market one of the first full-fledged American-made commercial dating sims — and their efforts are finally available for public viewing. Shira Oka: Second Chances puts you in the role of someone who has been given the chance to go back in time and relive their past. Will you make the most of your life? Will you end up with the girl of your dreams? Only time will tell. The game is, of course, filled with the traditional assortment of female character types, and has the typical anime art style. The game also gives you an interesting mix of traits that you can alter for character customization. And all of this is backed by an impressive roster of American voice talent. Unfortunately the game isn’t complete yet (they’ve been in development since 2005). However, playable demos are now available! Grab ’em today for Windows (alternate download site) and Mac (alternate download site). (Good on them for supporting Mac right out of the gate!) (UPDATE: The download is also available via BitTorrent.) The company hopes that this will spur on the development and growth of the American bishoujo industry. You can also take a look at the promo video below the cut, and find many other videos (including some gameplay examples) on their YouTube channel. 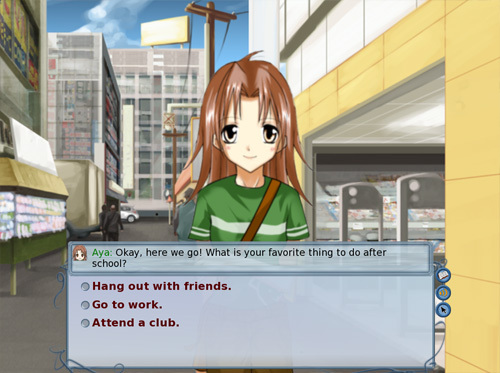 Romance games in English are very much affected by Sturgeon’s Law. For every one good story or game that gets released, there’s about nine or ten which are poorly written. And like the old, bad days of anime fandom, there’s a lot of content that’s not safe for work. The freeware games in the Renai Archive at http://www.renai.us . Most of the games here are worksafe. You’ll find a lot of visual novels (stories with art and music), and a few games with complex gameplay. I currently recommend RE: Alistair, Elven Relations, When I Rule the World, and Autumn. A blog that reviews Flash games at girlgamereview.blogspot.com . Hanako Games. This site is dedicated to cute, romantic games in a variety of genres. The demos are free, and the full versions cost ten to twenty dollars. insani.org , a site which showcases translated freeware visual novels and demos.